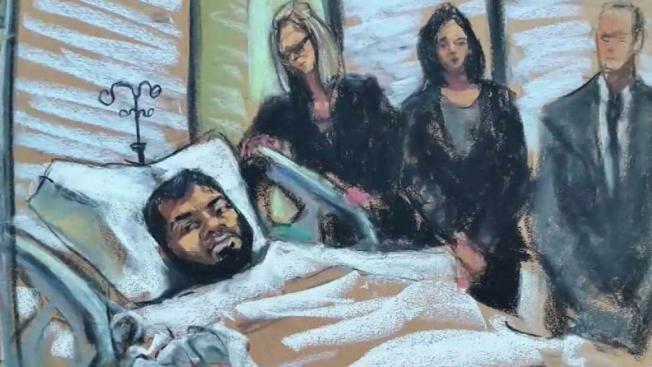 A Bangladeshi immigrant accused of setting off a pipe bomb in the New York subway system had his first court appearance on Wednesday via video from the hospital room where he is recovering from burns sustained in the blast. Marc Santia reports. A Bangladeshi immigrant accused of trying to set off a pipe bomb in a subway corridor but only succeeded in harming himself pleaded not guilty to terror charges on Thursday. Akayed Ullah had no visible injuries in Thursday's hearing after the flubbed attack in the corridor linking the Port Authority Bus Terminal and the Times Square subway station on Dec. 11. In the hearing, he told the judge he understood all the charges against him and said "at the moment" he was not guilty of the counts, which include providing material support to a terrorist organization and using a weapon of mass destruction. Ullah was the only person seriously hurt in the attack before the morning rush that day. Authorities said Ullah taunted President Donald Trump on Facebook before the attack. The president later demanded tightened immigration rules. Prosecutors have said he wanted to cause carnage to avenge U.S. aggression toward the Islamic State group. The pipe bomb did not fully explode. His lawyer had no immediate comment.